Key members of Congress are engaged in a new push to punish Iran for American hostage-taking by revoking visas for relatives of regime officials either attending college in the United States or working and living in the country. "[There] are a lot of regime officials who have students here who are enjoying the benefits of our education system who are here on visas, and we need to take a hard look at upping the costs," Rep. Michael Waltz (R., Fla.) said. "My concern, from a policy perspective, is right now there is very little downside to taking the hostages, and they barely keep them alive." The new push comes as tempers on Capitol Hill flared again this week over the Trump administration's Tuesday decision to grant Iraq a major reprieve on Iran sanctions, allowing Baghdad to renew a 90-day waiver to continue buying electricity from Tehran. Some advocates for the hostages' release also have called for tying any and all Iran sanctions waivers to the release of all Americans imprisoned in Iran. The Trump administration on Friday imposed new sanctions on 14 people and 16 entities connected to Iran's nuclear program, accusing Tehran of plotting to once again weaponize it. The move was another public slap at Iran over its nuclear program, but it didn't quell the waiver concerns. 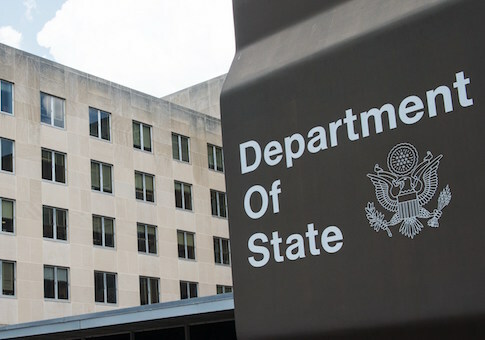 Critics have privately railed against the Iraq sanctions waiver, expressing outrage about what they say is a campaign within the State Department to grant a number of new such waivers. Iran hardliners believe there are some career State Department officials who are working to preserve the Obama-era nuclear deal despite Trump administration pledges to exert "maximum pressure" on Iran. While the main focus is on penalizing Iran and trying to win the release of at least six American hostages held there, Waltz said the State Department should consider a similar visa-revoking policy for all relatives of regime officials around the world who take Americans hostage. "I want to examine ways that when they look at making this decision, there's a lot more downside to them to taking American hostages—that they have a lot more to lose, and I think that's military pressure and certainly diplomatic pressure," he added. Lawmakers in recent weeks have demanded that the administration do more to punish Iran for failing to live up its repeated promises to assist in finding and freeing former FBI agent Robert Levinson, who was last seen on Iran's Kish Island in 2007 and is the longest-held hostage in American history. Earlier this month, Levinson's wife and family members of other Americans imprisoned in Iran used a House Foreign Affairs Committee hearing to lament the lack of progress in its efforts to free their loved ones. The other family members who participated in the hearing were speaking out for the release of Baquer and Siamak Namazi, two dual U.S.-Iranian citizens held in Iran for several years, as well as Nizar Zakka, a permanent legal U.S. resident, detained since late 2015. Rep. Ted Deutch (D., Fla.), who chairs the House Foreign Affairs subcommittee on the Middle East, Africa and International Terrorism and has spent years working with the Levinson family, said revoking visas is one lever to pull in exacting a cost for the hostage-taking. Other members of Congress would like to tie any sanction waivers the U.S. grants to Iran to the hostages' release. Earlier this month, Deutch sponsored a bill with Sen. Marco Rubio (R., Fla.) that marked the 12th anniversary of Levinson's disappearance and urged Trump to continue pursuing efforts to locate and return Levinson to the United States. "We are trying to make life difficult for people who are responsible for the kidnapping of Americans—and certainly [revoking] visas are one way to do it," Deutch said. "We're literally looking at everything we can possibly do to help drive home that point and increase pressure." Lawmakers pushing for the visa revocations are expressing similar frustration as those trying to prevent the administration from granting a new raft of Iran sanctions waivers. The issue of revoking Iranian visas has been raised with National Security Adviser John Bolton, as well as Brian Hook, the director of policy planning at the State Department who also serves as a senior policy adviser to Secretary of State Mike Pompeo, but so far there has been no action, according to Congressional sources. Waltz says he plans to send letters to the State Department and Department Homeland Security asking for the exact number of visas the U.S. provides to Iranian students and relatives of regime officials. "I'm going to ask them why, on the one hand, we're putting up with this hostage-taking when we're enacting sanctions, yet we're allowing these visas," said Waltz, who sits on the Armed Services' Intelligence and Emerging Threats subcommittee. "The State Department grants visas, but I think it might take some congressional pressure" for the administration to act, he said. This isn't the first time members of Congress have tried to use visa revocations to push back against Tehran. The Senate unanimously passed a measure in 2014 sponsored by Sen. Ted Cruz (R., Texas) that would have barred Iran's appointed ambassador to the United Nations from entering the United States. Cruz pointed out that Hamid Aboutalebi, Tehran's chosen top envoy to the U.N. in New York was a member of the student group that led the 1979 seizure of the U.S. embassy in Tehran. The Obama administration at the time called the nomination "extremely troubling" and refused to extend a visa for Aboutalebi. Rep. Mike McCaul of Texas, who serves as the top Republican on the House Foreign Affairs Committee, earlier this year introduced a bill designed to penalize Iran for human rights and hostage-taking that would revoke the visas of immediate family members of current Iranian regime officials. The bill would likely face a lengthy, uphill battle in the Democratic-run House, so members are pressing Trump officials to take action on their own. While members of Congress don't know the full number of Iranians with close ties to current and former regime officials, sources on Capitol Hill have said at least a handful are relatives of unrepentant leaders of the 1979 student seizure of the U.S. embassy in Tehran. Democratic President Jimmy Carter signed an executive order in 1979 revoking the visas of 7,000 Iranian students who were found to have visa violations and another 15,000 Iranians were told to leave the U.S. The order also forced 50,000 Iranian students then living in the United States to report to a U.S. immigration office.